Get the pass that gives you unlimited rides and unlimited adventure! For just $5, a Visitor Pass provides hours of exploring the Twin Cities. It's valid for unlimited rides on Metro Transit buses and on METRO Blue, Green & Red lines (not valid on Northstar or express bus routes). Use it for fast, frequent service to downtown Minneapolis, downtown St. Paul, Mall of America and hundreds of other popular attractions. A Visitor Pass is easy to use. Simply touch it to the card reader at METRO light-rail stations or on any bus to pay for your trip. Once you use it for the first time, you can keep riding until 2 a.m.! Just remember to touch it to the reader on every bus or rail station; Transit Police officers regularly check customers to ensure they have validated their passes. 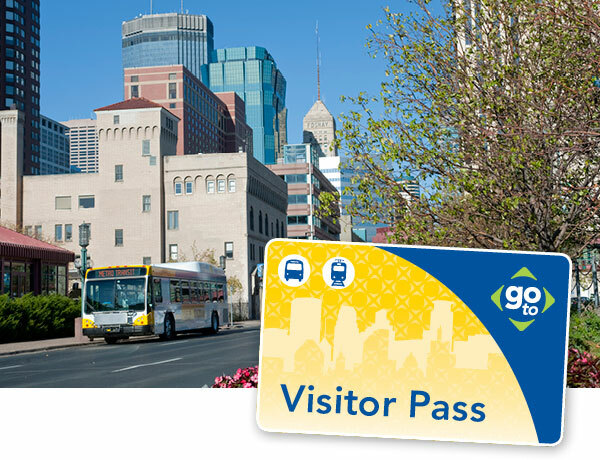 Visitor Passes are ONLY available online or at Metro Transit Service Centers; purchase them in advance. The pass isn’t active until its first use on a bus or METRO train. Groups that want to purchase more than 100 passes are eligible for a discount. Please call 612-349-7750 to learn more about group discounts.